One of the fastest and easiest ways I found to cook tofu was to fry it, and sauce it. 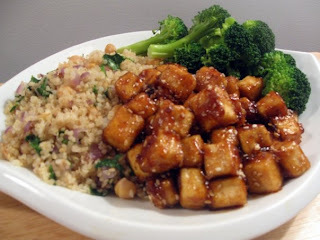 This honey garlic tofu was a play off of those sesame chicken dishes I used to eat a lot in university. 1. Cut firm tofu in half, or use the whole block, depending how many people you are feeding. Cut into small cubes, about 2 centermetres each. Dredge the tofu cubes in a mixture of corn starch, salt and pepper. The corn starch coating will help create a crust on the tofu, and help the sauce adhere to it. 2. Pour a little oil into a frying pan or wok, and toss in the tofu. Mix and flip the tofu around to make sure all sides get cooked. You don't want uncooked corn starch. 3. In a small pot, combine soy sauce, honey, garlic, and ginger, and boil. Then simmer and reduce it down into more of a sauce if needed. If you want, you could add corn starch to thicken it up. If you are really pressed for time, or don't feel like making sauce, just use store bought. You can use honey garlic sauce, or even BBQ sauce. 4. Toss fried tofu cubes with sauce and make sure everything is evenly coated. Drizzle with sesame seeds for a little crunch, and to make it more presentable.